Can You Take Fish Oil & Garlic Supplements Together? Both fish oil and garlic contain a mixture of chemicals that have physiological effects on the human body, leading to concerns of possible interactions from taking both at the same time. While no evidence of toxic interactions between garlic and fish oil has been found, there is still a risk of possible adverse effects. As with any supplement, consult your doctor before taking fish oil and garlic supplements at the same time. Preliminary studies of combined fish oil and garlic supplements have not found any significant safety concerns. 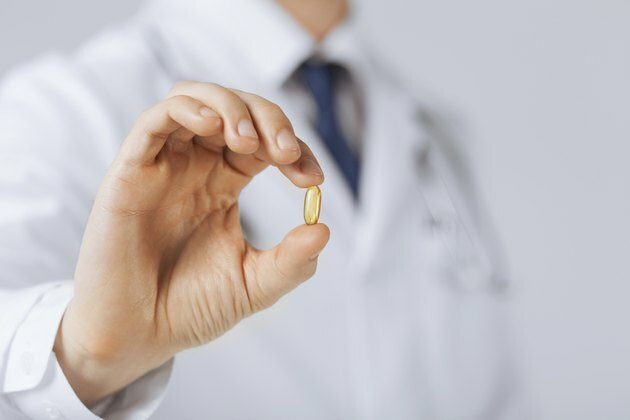 In one study of rats, lasting 12 months, a combination of fish oil and garlic supplements did not cause any significant effects on behavior, organ function or other blood tests, reports an article published in the September 2001 issue of the "International Journal of Vitamin and Nutrition Research." Preliminary studies in humans also suggest that fish oil and garlic are safe to take together. In a small trial of 50 men with high cholesterol, a combination of fish oil and garlic did not cause any adverse effects over the course of 12 weeks, reports a study published in 1997 in "The American Journal of Clinical Nutrition." However, this study was very small and its duration was short. Even though studies have not found serious side effects from combining fish oil and garlic, you should still use caution with this combination. Both garlic and fish oil can have a blood-thinning effect, meaning they can reduce the ability of blood to clot. Taking both supplements at the same time may compound the blood-thinning effect, which can possibly increase the risk of excess bleeding, according to MedlinePlus. Due to the blood-thinning effect of garlic and fish oil, taking other herbs or medications that also reduce blood-clotting may lead to additional increases in the risk of excess bleeding. Over-the-counter medications with blood-thinning effects include aspirin, naproxen and ibuprofen. Prescription medications such as warfarin, haperin, diclofenac and clopidogrel also have anti-clotting effects. Many other herbal products can also contribute to blood-thinning, including ginkgo, turmeric and vitamin E. Ask your doctor before taking any of these products at the same time as garlic and fish oil. International Journal of Vitamin and Nutrition Research; Acute and Chronic Toxicity Study of Fish Oil and Garlic Combination; N.C. Marcos, et al. The American Journal of Clinical Nutrition; Effect of Garlic and Fish-Oil Supplementation on Serum Lipid and Lipoprotein Concentrations in Hypercholestrolemic Men; Adam J. Adler, et al.